The Realist Orchestral Bass Transducer Wood or Copper Element Orchestral Bass Pickup, New! 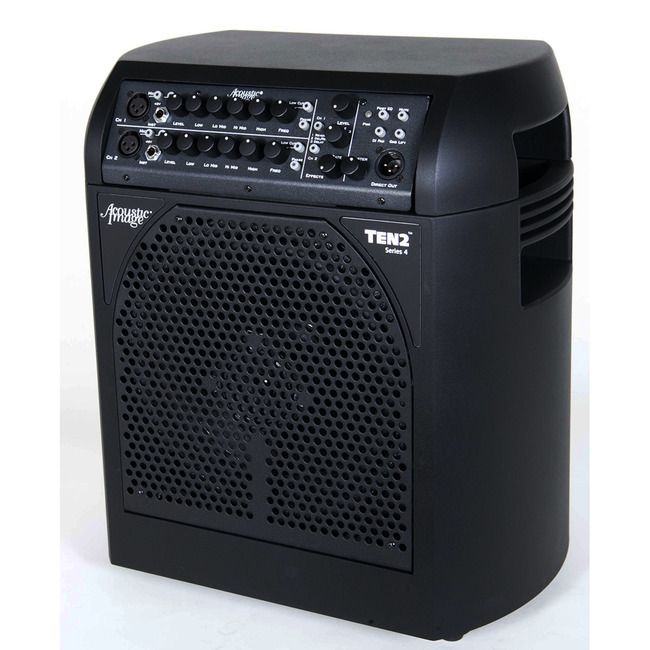 The Acoustic Image Ten2 is available in a Two Channel Combo (Ten2 S4plus, $1649), and also a – One Channel Combo (Ten2 S4, $1449), or as an extension cabinet (Ten2 EX S4, $709). PLEASE MAKE YOUR SELECTION. The Acoustic Image Ten2 has a superb class-D power amplifier with switch mode power supply, a compact two-way speaker system and a sophisticated, sensitive preamplifier. It also has the exclusive Cabrio Docking System that allow the head unit to be removed and used as a stand-alone amplifier. The power amp is a high efficiency, 800W design that requires no external heat sinks or cooling fans and is capable of driving loads as low as 2 ohms. AC power and output speaker jacks are located on the rear of the enclosure. A standard, three-prong detachable AC power cord is used to provide power to the unit, while an AC voltage selection switch allows the unit to operate at 115V/60 Hz or 230V/50 Hz. The input channels of the preamp incorporate combo jack interfaces that allow either a high impedance instrument input (to optimize the sound of piezo-type pickups) or a mic input with a built in 10 dB pad, an effects loop with return level control, a selectable low cut filter for reduction of low frequency boominess, a phase reverse switch, a direct out capability with ground lift and pre/post EQ switch, a master level control and a mute switch. The preamp also has a switch that allows the second channel to be disconnected from the main amp and connected to a satellite power amp to create a stereo system. The speaker enclosure incorporates a 2×10-inch woofer configuration (one is downfiring and the other is front firing) and a 2.5-inch tweeter that is coaxially mounted in front of the front firing woofer. The tweeter has a three position level control (0 dB, -6 dB and off). The exclusive Room Coupling Control allows the user to adjust the output of the downfiring woofer to help control boominess in certain acoustic settings. A built-in, spring-loaded tilt mechanism allows the cabinet to be tilted back to better direct sound to your listening position. The cabinet is made of an acoustically inert, high durability, injection molded polymer material which dramatically reduces the weight of the cabinet. Each unit comes with a fitted slip cover and shoulder strap.